I honestly cannot wait for this movie to come out.. For multiple reasons. 1) JOHNNY DEPP – Need I say more? Well, no, of course not. Johnny is pure genius, personified. He brings humor and genuine talent to every movie he’s in. Literally, no movie that he’s been in would be complete without him. Even going back to his early days, his talent shone through in every role he took on. From Edward Scissorhands to What’s Eating Gilbert Grape and even his first film, A Nightmare on Elm Street, those characters completed the films (at least in my opinion). I can’t say enough about how I adore his skill to transform a regular role into something wonderful and spectacular. The point? The guy is mind-blowing. End of story. 2) Helena Bonham Carter. Say what?! I had no idea she was going to be in this film, and now that I know, I couldn’t be happier. This woman has a spell on me. Seriously, she’s phenomenal. She’s beautiful and talented in a very unconventional way. She’s not the typical blonde hair-blue eyed-fake beauty that our society has made the standard. No, she’s amazing in a real and original way that accentuates her acting abilities. She can pull off creepy in an I-wanna-kill-you-and-bake-you-into-a-pie-type way (Sweeney Todd: The Demon Barber of Fleet Street), while also being a total sweetheart in an Oh-crap-my-fiance-married-a-dead-girl-but-I’ll-forgive-him-type way (Corpse Bride). Yeah, she’s pretty fantastic, too. 3) Gore Verbinski is directing. This is the guy that directed the first three Pirates of the Caribbean films, so you know there will be many action sequences packed with explosions and combat. So, that’s a pretty awesome reason to see this movie as well. ‘Cause I meant, come on, who doesn’t love the occasional cinema violence? Everyone already knows that Johnny and Helena combined makes for a spectacular combination of awesomeness – so that awesomeness should only be enhanced with Gore thrown into the mix. Well, I know it’s been out for quite a long time but this review is long overdue. 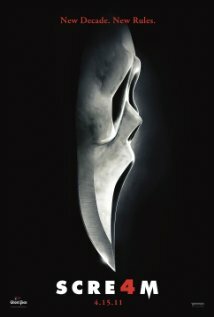 Scream 4. That’s right, I said it. I absolutely love this movie. I’ve seen it about 30 times give or take a couple. Horror is my obsession and right now, Scre4m is the best in my opinion. Ten years later. New decade, new rules. Let’s start with the characters. First, the obvious ones – Sidney Prescott, Officer Dewey (now the sheriff) and of course Gale Weathers (now Weathers-Riley). These three have been faithful throughout the entire franchise, encountering numerous near-death experiences. Sidney, the main character, is returning to Woodsboro for the “last stop on her book tour and first stop on her road to a new life.” Gale and Dewey have been married for the past ten years and are still living in Woodsboro, which as you can guess takes a toll on Gale and her ego. A small town life and small town husband gets to be rough for the former reporter that’s now focusing on fiction writing. Now, the newbies – Jill Prescott, – Sid’s cousin – Kirby Reed, Olivia Morris (all three best friends), Charlie Walker, Robbie Mercer and Trevor Sheldon. These high school kids are basically replicas of the former main characters from the first Scream. Some might think that makes for a boring set of newbies, but each bring their own twist to this installment. Besides the high school kids, there’s also Deputy Judy Hicks, Deputy Hoss and Deputy Perkins. Now that Dewey has been promoted to sheriff, he has a small team behind him. Hicks is the typical girl-cop in love with her superior (Dewey), while Hoss and Perkins are the typical sidekicks that play an off-beat comedic routine throughout the movie. Everything about this movie is amazing and even after seeing it about 30 times, I still can’t seem to take it out of the DVD player. Covenants, cults and curses: the third addition to the “Paranormal” series adds more background to the story of Katie and Kristi than you could have imagined, while also confusing the crap out of you. This pre-prequel is definitely the most whack out of the three. It catches a glimpse into the lives of the two young girls with their first encounters with the demon, now named Toby by little Kristi, who thinks she’s befriended it. The entire storyline is pretty terrifying, just like the first two. Except this time instead of repeating the same effects for a third time, there’s a new twist to everything. From hair-pulling to a floating kitchen, you’ll be scared out of your wits for these little girls. “Paranormal 3” also portrays “Toby” as a more real entity. We see little Kristi talking with it, playing tea party with it and laughing with it. Therefore, we realize this entity has already been around for a while and, as you all know, will continue to be around. I will say, though, that I was disappointed that the creepy footsteps were basically nonexistent in this installment. Those footsteps are what I thought made the first two especially terrifying. Don’t get me wrong; this one makes up for it with many new horrific tricks that will still make you jump clear out of your seat. Then, you get to the end. This is where the movie lost the final star with me. A cult has been thrown into the mix, adding to what we learned in the second movie. However, the end is pretty much thrown at you and you’re left sitting in the theater afterwards running over what just happened and trying to figure out why. With that being said, though confusing, the end is the part that will make you cover your eyes, if you haven’t already. Though the end takes a second to gather and make sense of, the whole movie will have you sitting with your legs up in the chair, fingers half-covering your eyes with your shoulders leaning on the person sitting next to you. “Paranormal 3” is great for a scream-inducing, stay-up-till-3-a.m., scared-out-of-your-wits kind of night. Haters beware – Justin Bieber has taken entertainment to the next level. With explosions and neon lights to purple sneakers and screaming teen girls, “Justin Bieber: Never Say Never” is a 3D look into the life of the talented Justin Bieber. It proves to be an uplifting story of triumph and exhilaration. “Never Say Never” is filled with cherished moments from Bieber’s childhood that provide the audience with a peek into his life prior to spreading “Bieber fever”. These genuine clips add to the background of who Justin Bieber was at a younger age. The movie, filmed like a documentary, never slows down. It follows Justin on his tour bus, details his life before becoming a16-year-old sensation that immediately sends girls into shock and features his famous voice during vocal practice. Using the perspective of his loved ones, the movie shows Bieber’s true character. Interviews with his mother, grandparents, manager, vocal coach and others make the movie more believable and relatable to the audience. “Never Say Never 3D” shows Justin’s haters just how much passion and work he’s put into his already spectacular career. No matter who you are, seeing a young kid work so hard to accomplish his dreams and turn them into reality will be a moving experience. Whether you have “Bieber fever” or you’re as far away from the pop spectrum as possible, this movie definitely shows you the reality of what being Justin Bieber is like. And who knows, maybe even that macho football player who claims to be Bieber’s biggest hater could all of a sudden have a severe, incurable case of “Bieber fever”. While listening to the thundering stomp of footsteps that climb up the stairs of a well-off suburban home, you can’t help but close your eyes and wait for the nightmare to be over. With clenched fists and half-open eyes, the scene before you unfolds. With the same creepy effects and startling sequences, the movie catches the attention of the audience from the beginning. With an opening in the home of the sister of the protagonist from the first movie, Katie, we realize that “Paranormal Activity 2” is actually a prequel to the first and none of the incidences that occurred before have happened yet. The plot has a more unexpected twist than the first. Now we get to see exactly why the horrible events from the first movie occurred. Even with the low-budget special effects, viewers are still shaking in their seats, trying to anticipate what will happen next. Although the effects mimic those of the first, they don’t bore because they’ve been played up more than before. There’s still the same “body being pulled out of the room” trick. However, this time it happens twice, providing the audience with a shock of surprise. Overall, this movie surpasses the first by far. With even more jolting sequences, it provides for many more opportunities to jump and scream and hold onto the person next to you — especially in the last fifteen minutes.